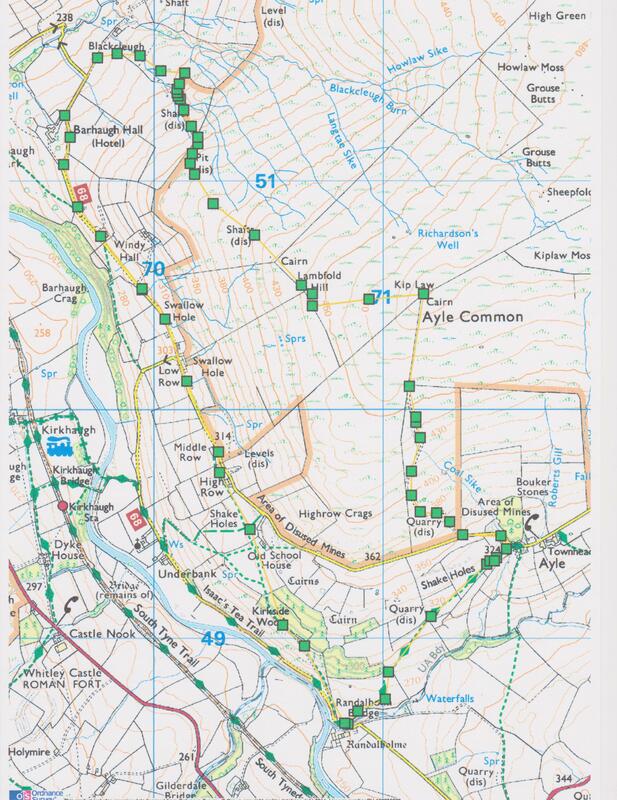 Route to Start: Take the A686 Hexham road out of Alston and after about 1km take the minor road on the left signposted R’holm. After about 1km you reach Randalholme. There is space for parking of cars on the grass verge at the side of the road before you reach the Randalholme Farm (Grid reference NY 709 486). Route: Walk down the road crossing the bridge over Ayle Burn where you will immediately see a Public Footpath sign on the right. Follow this footpath, way-marked Isaac’s Tea Trail, through the gate, climbing the hill, and heading for a gate in the topmost corner of the field. Follow the path through three more fields and in the third field stay close to the wall on the right and go through the gate shortly before the end of the field. Follow the path up to the road at Ayle and turn left. After approx. 250m go through a gate on the right on to Open Access land. Follow the well-defined track until it fades just before the summit of Kip Law with its distinctive cairn. Go over the stile in the wall and head downhill roughly due west. There is no path here but head for where the fence ahead meets the wall on the left. Here there is a gate in the fence. Go through this and follow a path downhill heading in a North Westerly direction. Where this path bears westward to Windy Hall keep heading roughly north-west aiming for Barhaugh Hall until you reach the wall at the boundary of the Open Access land. Turn right and follow the wall along, past a disused pit, until you reach the wall corner. Turn left crossing a fence at the wall corner in to a plantation. Follow the wall downwards heading northerly, crossing a stream and keeping the wall, and then a fence, to your left until you reach a ruined building in the northern corner of the plantation. Here exit through the gate and head roughly due west, cross the stream again, and then head for the gate at the bend in the road. Go through the gate and follow the road left all the way to Low Row. At the road junction continue straight on through the gate and along the road signed to Ayle until you reach Middle Row. Here, leave the road, turning right on to the signposted footpath over a ladder stile. Follow this footpath as it heads Southwards through several fields until you reach the stile by a gate in to Kirkside Wood. Continue along the track through the wood until it emerges on the road at Randalholme.